Is the rock chip/crack repair really free? Will you come to my location? Yes! Siri Auto Glass provides mobile service. We'll come to wherever you're located in Humble - your home, office etc. What if I need an entire windshield/auto glass replacement? If the damage on your windshield can't be repaired, then you need a new windshield (replacement). Get your windshield replaced through insurance and we'll give you $100 cash back! All you have to do is give us a call and we'll do the rest. We'll handle the paperwork, do the replacement, and then bill your insurance company for you. We agree to most insurance companies pricing and will not bill them, or you, anything additional. Thank you for visiting Siri Auto Glass! Did you like our site? We'll come to wherever you're located in Humble! We're located one block west of Veterans Memorial / Stuebner Airlines Dr on FM1960. Our address - 4714 FM 1960 W, Suite# 112, Houston TX 77069. Will my insurance company waive my deductible? Will my rates stay the same? Yes. Because of the large cost of new windshields, most insurance companies will waive your deductible if you get your windshield repaired instead of replaced. On top of this, virtually all insurers consider windshield repair to be a no-fault claim, which means your policy rates won't be affected! Give us a call and we'll handle everything. What if I don't have or don't want to go through insurance? Don't worry, we'll give you a very affordable quote. And we also accept cash and checks. Is Siri Auto Glass a reliable and reputable company? 2. Certified - all our windshield repair technicians, including the President of the company, have been certified by the National Windshield Repair Association. 4. Resin - we have developed our own special blend of resin that actually seals and permanently fixes the cracks. This resin is a proprietary product of our company and is not available to anyone else. Why fix a chip if it's small or hasn't spread yet? The longer you delay in fixing the chip, the higher the possibility of the damage area spreading. Damage can spread from bumps in the road, temperature changes (hot/cold) or wind stress on your windshield. Eventually, these un-repaired rock chips will "crack-out" all the way across and require you to replace your windshield, which is far more expensive. It is a lot cheaper to repair them before this happens. 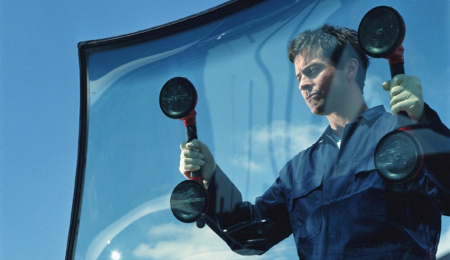 Windshield repair also tends to look seamless when done as soon as possible after damage occurs. Otherwise, rain, dust and road grime will contaminate the damage over time thus inhibiting the best cosmetic results and may even cause further spreading of the damaged area. Should small surface chips and pits be repaired? Even a pin head size surface imperfection on a windshield has the potential to get worse. In particular, if the windshield damage has a shadow, or black or silver discoloration around the impact point, it could "crack out" if not repaired. Pits and surface chips are the beginning of potential further damage. Visible damage should be taken care of with windshield repair ASAP. Should I contact my agent or insurance company? At Siri Auto Glass, we're experts at verifying coverage, filing the claim and handling all the paperwork. We'll contact your insurance company and submit the claim for the windshield repair on your behalf, hassle free. Or if you prefer, you can also pay our repair technician directly and file the claim personally. What zipcodes in Humble does Siri Auto Glass serve?